Like every villain in every movie, you can't kill them once. Back from the dead they come, and until this season is officially over, the San Diego Chargers and Dallas Cowboys aren't dead yet. The villains of the NFL have gone through more turmoil this season, for both clubs it probably feels like they've played two seasons in one. Injuries, off the field drama, question marks surrounding the future of their head coaches, you name it, the Chargers & Cowboys have experienced it in 2008. After ending their '07 runs on a bad note, the Dallas Cowboys ending with a disappointing home playoff loss to their division rival Giants, and the Chargers becoming victim #18 of the New England Patriots. 2008 was supposed to be the year they broke through, but 2008 would become a season plagued with disappoint for both organizations. However, come 4:00 today, both the Cowboys and Chargers will control their fate and with victories, both of them will be back in the postseason. 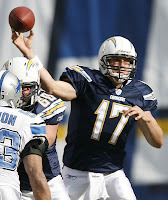 The San Diego Chargers Starting in training camp, the absence of all-pro linebacker, Shawn Merriman, became a concern. Merriman, the heart and soul of the Charger defense, was lost for the season with a serious knee injury. An already 20th ranked defense in 2007, would need to play alot better in 2008 if they wanted any significant shot at a Super Bowl in the coming season, and without Merriman, things weren't looking up. 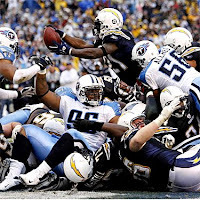 The Chargers would drop their first two games of the '08 season in dramatic fashion. A late 4th quarter comeback from Jake Delhomme and the Carolina Panthers and a missed fumble call by the refs in Denver would lead to a Jay Cutler touchdown and loss #2 for the Chargers. Not dead yet, the Chargers would go on to win three of their next four games including one 20-point victory over rival New England. Scheduling did not favor these Chargers, in the weeks following their home win over New England, the Chargers were headed from sunny San Diego to the freezing cold of Buffalo and a rainy trip to London, England to play the Saints in a European Vacation. You guessed it, the Chargers would drop two straight games and fall back to 3-5, their playoff chances looking slim at the halfway point. Escaping Kansas City with a one-point victory over the Chiefs would be the only success the Chargers had in the month of November. After that win, the Chargers would drop three straight games to playoff bound Pittsburgh, Indy, and Atlanta. The now 4-8 Chargers were now left for dead, forgotten and written off, by everyone including myself. With four games remaining, the Broncos had two games on the Chargers and with a win would clinch the division and essentially eliminate the '08 Chargers from playoff contention. The once devastating Charger back, LaDainian Tomlinson, was in the midst of the most dismal season of his career. Between weeks 5 through 10, Tomlinson failed to rush for one touchdown. Over the entire season, LT has only gone over the century mark twice. To add insult to probable injury, his former under study, Michael Turner, is now an MVP candidate and has rushed for nearly 500 yards more than the Charger running back. Head coach, Norv Turner, had just as many problems as his team. Being the guy who was supposed to get them over the hump wasn't what Norv had been. Fans, media, and even players were calling for Norv to be replaced, and at 4-8, who was going to blame them? With all that, the Chargers were Not dead yet, the Chargers would drop Oakland, escape Kansas City with another 1-point win, and destroy Tampa Bay at their place to the tune of 41-24. Phil Rivers & the Chargers were back. After back-2-back losses by the Broncos, the Chargers are alive and well. To add even more pressure to the collapse of the Broncos, they have to go to San Diego and beat the streaking Chargers at their place. The phrase MORTAL LOCK comes into play. The Chargers are better than they've played, sit at 7-8 with an opportunity to make the playoffs, right or wrong, the Chargers are getting in. The Dallas Cowboys Literally, this is the tale of 15 different seasons wrapped up in one. More controversy in one season than 29 other teams have in ten. From the suspension to the reinstatement of embattled corner, Adam Jones, to the star wideout, Terrell Owens, multiple complaints about his involvement in the offense, the Cowboys put the fun back in dysfunctional. After winning their first three games of the season including a road victory in Lambeau, the Cowboys have been fighting for their postseason lives. The Silver & Blue lost two of their next three games to Arizona and Washington. That wasn't even the worst part, the Cowboys lost pro bowl quarterback, Tony Romo for 3 weeks and fast start rookie, Felix Jones, for the entire season. In Romo's absence, the Cowboys would drop 2 of their next three and score just 14 points per game. Upon Romo's return, the Cowboys had traded for another malcontent wideout in Roy Williams, and were hovering around third place in their division with a record of 5-4. Romo would come back and win his next three starts before a fourth quarter collapse in Pittsburgh which would have put the Cowboys in the drivers seat. The Cowboys' last four games against the Steelers, Giants, Ravens, and Eagles, would pit them against four of the NFL's best defenses, for an offense that was out of rhythm and withstanding constant complaints from their star receiver, Dallas was in trouble. Dropping two of their three games heading into this week put the Cowboys behind the 8-ball. Losses from contending Minnesota and Tampa Bay in week 16, amazingly put the Cowboys right where they needed to be. One game left, needing just a win to launch them into the postseason. Yes, Wade Phillips is on the proverbial hot seat, when your dealing with an owner like Jerry Jones, your always on the hot seat. Yes, Terrell Owens demands the ball and when he doesn't get it, major problems arise. Yes, with Marion Barber, the Cowboys star running back, attempting to recover from his toe injury while playing, the Cowboys aren't playing with all their weapons at full strength. Even still, the Cowboys have a top ranked defense that have been making plays for several weeks now. DeMarcus Ware comes to play every week, never mind what the offense is doing. If the Cowboys can stop Philly from scoring, welcome to the playoffs Dallas. In the words of some dude from the 70's, "what a long strange trip it's been." In several hours we'll find out if the Chargers and Cowboys are back from the dead for the last time, or we'll know who has been the biggest dissappointment of the 2008 season. GO COWBOYS!